The site in eastern Croatia of one of the early war crimes of the Yugoslav Wars, namely a massacre of mostly Croats who had taken refuge in the basement of a hospital during the Battle of Vukovar but were taken by Serbian militias to a makeshift prison camp outside Vukovar after the battle, then shot and buried in a mass grave. There's a sombre Memorial Centre at the site of the prison camp, a marker by the mass grave site as well as a separate monument dedicated to the Ovčara victims in Vukovar. More background info: for the general, wider background see under Croatia and Vukovar. Towards the final stages of the Battle of Vukovar in November 1991, a few hundred people had taken refuge in the basement of Vukovar's hospital, including those who sustained injuries in the fighting, as well as uninjured civilians who deemed the hospital a safe haven. And it should have been that. In fact, as the battle was nearing its end, with the Croatian side defeated, an evacuation of the hospital was negotiated between the victorious JNA (Yugoslav Army) and international observes and the Red Cross. But instead of giving the people safe passage from the hospital to areas away from the battlegrounds, the JNA took them to a military barracks. Some hospital staff amongst those taken away were released, and the rest of the people were handed over to Serbian paramilitary forces who had fought with the JNA against the Croat defenders. That was a bad move. These Serbs were full of ethnic hatred and unbridled nationalistic zeal. While the JNA moved on, the Serbian militias moved the group captured at the hospital to an isolated farm a few miles south-east of Vukovar, where they were crammed together in a hangar or barn turned into a makeshift prison camp. Here they were first beaten and tortured. Then the entire group, some 263 people in total, mostly civilians, were taken to a site nearby and shot in batches. Afterwards they were all buried in a pre-prepared mass grave. That mass grave was discovered less than a year later in October 1992 and placed under UN protection. After the war, the bodies were exhumed in 1996. They were transferred for forensic investigation, and within the next few years the majority of the bodies were identified. Not all of the people taken from the hospital to Ovčara have been accounted for, though. So there is a suspicion that there might be another grave site somewhere in the vicinity yet to be discovered. The Vukovar Massacre was at the time the worst such atrocity committed in Europe since WWII (though it was later surpassed, esp. by Srebrenica). Some of the perpetrators were tried at the ICTY (International Criminal Tribunal for the former Yugoslavia) in The Hague, Netherlands. By 2015, more than a dozen people involved in the massacre had been convicted. The Memorial Centre at the site of the Ovčara farm opened on 20 November 2006 to coincide with the 15th anniversary of the massacre. What there is to see: Three distinct places, in fact: most importantly the Memorial Centre and the site of the mass grave, both a few miles outside of town, and a separate memorial in Vukovar itself. The Ovčara Memorial Centre is set back from any main roads in the middle of flat farmland, with a few ruined farm buildings around, but not much else. Of the original barn where the victims were held prior the massacre, not much remains, but the original sliding doors have been integrated into the otherwise purpose-built concrete memorial centre. In the glass-and-concrete anteroom a large visitor book rests on a stand, and it looked like a lot of people had made use of it. Inside there's a dividing wall in front of you, and to the left is the centre's shop and ticket counter. The shop is well stocked, including numerous books, but with only very few items in a language other than Croatian. There are posters, postcards and souvenirs on sale too. To the right of the entrance and the dividing wall is the main memorial room. It's a very unusual design. It's dark and gloomy. Around the walls, portrait photos of the victims light up and fade again, underneath each of the images the names and dates of birth of the victim in question are given. Whether this lighting mode follows a specific pattern or not I could not determine. Set into the floor directly underneath the lit-up faces, there are rows of shallow glass display cases filled with straw and a selection of artefacts. These range from personal belongings (glasses, watches, car keys, rosaries), documents (like ID cards or driving licences) to forensic photos of jaws and such like. Relics of the dead. In the centre of the room is a spiralling light installation, where the names of victims illuminated in red constantly keep swirling downwards towards a red candle at the pivot at the bottom of the spiral. Directly above is a round opening in the concrete roof to expose a part of the original corrugated iron roofing. This round opening itself is framed by a ring of tiny white LED light “stars”. The floor of the memorial centre is made of raw concrete into which bullet casings have been pressed. So you are constantly walking on cartridges. Most are regular rifle or machine-gun size, but a few are bigger ones of a higher calibre probably fired from tanks or planes. So the whole thing is highly symbolic and sombre rather than informative. What exactly happened here is not elaborated on. You either have to know already (as seems to be assumed), or buy a book or do your online research afterwards. But you won't learn anything here, unless you ask at the counter (the staff seemed quite eager to explain things if you asked). Also uncommodified, in the sense of lacking information, is the site of the mass grave in which the victims were buried. This is a few hundred yards from the Memorial Centre in a field by a grove of trees. There's a black marble slab with a shape cut out of it in the top half that may represent a dove in flight. It's not quite clear, but it's a shape that recurs on many of the regions memorial stones. There's a Croatian-only inscription on the stone, and at the bottom there was a wreath when I was there. A couple of dozen memorial candles were placed on a stone base next to the memorial stone. A short distance from the memorial stone is a square patch of small bushes, presumably representing the mass grave itself. And at the front of it various individual memorial plaques are lined up, plus yet more wreaths, rosaries and candles. When I was there, there were also a couple of mobile/temporary souvenir stalls by the car park. Both sites would have felt very silent and lonely if it hadn't been for the coachloads of teenagers, presumably school classes on history outings carted here as part of their patriotic priming. At the Memorial Centre I was lucky that the throng was just getting ready to leave, so I waited a while and then had the memorial room pretty much to myself and it was nice and quiet. At the mass grave marker I arrived before the crowds did, and when they appeared I made a quick exit. 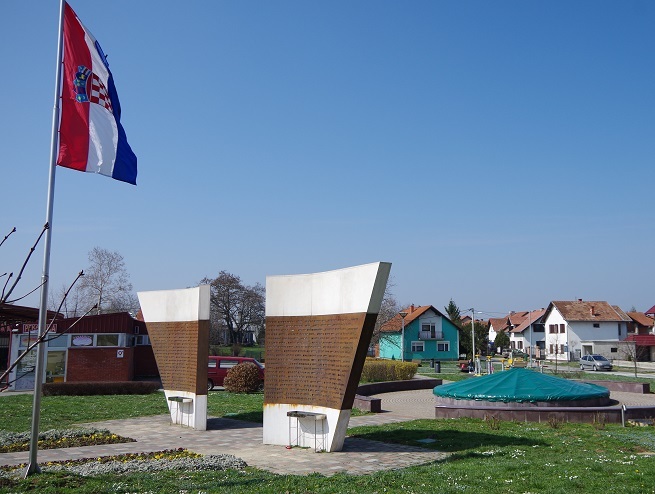 There is also a dedicated Ovčara Victims Monument within the Vukovar city limits, on the outskirts south of the landmark water tower. It's in the middle of a residential area, near some shops, so it's a less sombre location to begin with. The monument consists of two concrete wings, the middle part of which is covered with a rusty metal coating into which the names of the identified victims are engraved. Behind it is a little circular square and in front of it is a flagpole flying the Croatian national flag. All in all I found the Ovčara sites a little too abstract. A bit more informative commodification would have been good, especially of course at the Memorial Centre. That said, though, the design of the latter is impressive in a very sombre way. Locations: the Memorial Centre and mass grave site are just a few miles to the south-east of Vukovar, the monument in the eastern part of Vukovar itself, less than half a mile from the iconic water tower en route out of town. Access and costs: a bit off the beaten track, but not too difficult to find; inexpensive. Details: most visitors are school groups who get carted to the sites by bus, but as an independent traveller you'll need you own means of transport. To get to the Memorial Centre from the centre of Vukovar first take the main road (2) south (in the direction of Sotin and Ilok), and then after a couple of miles turn right into a small country road. The centre is signposted “Spomen Dom Ovčara”. There's a dedicated (free) car park across the road. Opening times: daily from 10 a.m. to 5 p.m. The mass grave site is freely accessible at all times (wouldn't make much sense in the dark, though). To get there from the Memorial Centre take the road south and after a bit over half a mile (1 km) turn left. This road takes you to a small car park (free). The monument and mass grave marker are a short walk onwards. It's all clearly marked. The Ovčara Monument in Vukovar is at Trg žrtava Ovčare, just off the main 2 road (called here Ul. bana Josipa Jelačića); coming from Vukovar town centre turn right into Ðakovačka ul. – there's parking at a shop to the south of the monument. Time required: something like half an hour at the Memorial Centre, perhaps plus shop browsing time, and only a few minutes each at the mass grave marker and at the monument in Vukovar. Combinations with other dark destinations: see under Vukovar. The closest other site covered here would be the Memorial Cemetery, which is a four- mile (6 km) drive first on an unmarked country road heading east and then on the main 2 road north towards Vukovar. But the site thematically most linked to Ovčara are the memorial rooms at the Vukovar Hospital – as this is where the victims were taken from to be massacred at Ovčara.